Hamza has a bachelor’s degree in physiotherapy from the Higher School of Health Sciences and Techniques of Monastir, and is currently pursuing a master’s degree in health law. He first started being involved in civil society during his early years in college, because he wanted to support and improve his community during the critical times that his country was facing. 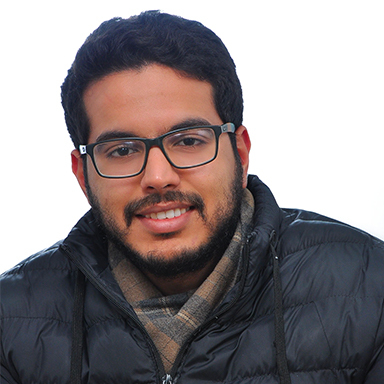 One of his first experiences in civil society was during the first year of the Tunisian Youth Parliament where he was part of the 60 young Tunisians who had been selected to discuss the main issues facing Tunisia during the first couple of years after the revolution. In 2014, he participated in the legislative and presidential elections by volunteering with the Tunisian Association for the Integrity and Democracy of Elections, an organization that aims to promote and protect democratic values, particularly the right to vote. During the municipal elections of 2018, he participated in an exploratory mission organized by the high independent authority for elections in collaboration with other international NGO’s for representatives of electoral management bodies from different Arab countries. Hamza has also worked for two other organizations. The first organization’s objectives was to make sports more accessible to the general public, and to raise awareness for the importance of sports for our physical and mental health. He was a member of the organizing committee of the second edition of his hometown’s half marathon and has volunteered for other big sporting events such as the African basketball championships. The second organization, Help Me Learn, is an educational, cultural, and social organization which tries to improve the level and conditions of children in disadvantaged schools by creating libraries and cultural clubs, and providing care for students with special needs. For his placement, he works with the Fondation de France and the Association des Tunisiens des Grandes Écoles (ATUGE) on a program called Youth Solidarity in the Mediterranean, which consists of an annual call for projects that support professional integration of marginalized youth and the creation of sponsored activities for youth.